Hiring a professional to install a ceiling fan is not only practical, but it's incredibly safer. 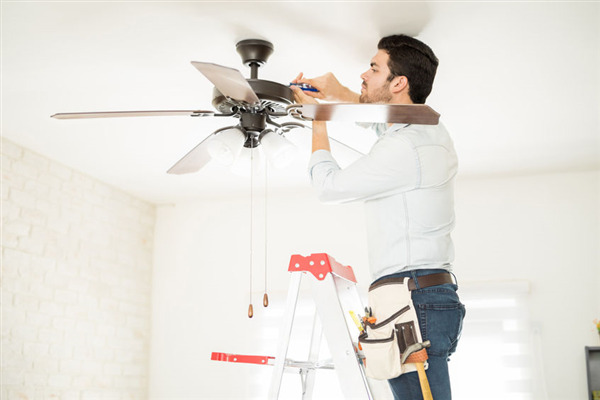 A professional has the tools and expertise to not only install the ceiling fan properly, but follow safety protocol so nobody gets harmed in the process. Between electrical sparks and the possibility of falling blades, hiring a professional is the best choice available. If one doesn't know what they're doing, it's going to take considerably longer to install a ceiling fan. Between the "trial and error" situations that can occur during a ceiling fan installation process, it can take hours (or even days) to get a ceiling fan to simply operate without an issue. So even if one commits to the idea of installing ceiling fan on their own, it doesn't mean that it'll work fine without any hitches. An improperly installed fan can cause shorts or lead to other electrical issues throughout a home. By hiring a professional, one won't have to worry about wiring issues that cause shorts throughout the home as one tries to keep cool. If one installs a ceiling fan on their own as a non-professional, being left in the cold in the event a ceiling fan fails is a great possibility. By hiring a professional, they will be held responsible in the event the ceiling fan fails to operate. A professional can compensate for a faulty fan. If one doesn't want to hear a fan rattling about as it operates, hiring a professional is necessary. Professionals understand ceiling boxes and what the fan requires for operation, meaning that your fan will remain silent as it is keeping a home cool. Considering the information above, hiring a professional to install a ceiling fan is incredibly important. Thankfully, Harrison Electric is here to do exactly that. Contact us today for more information!